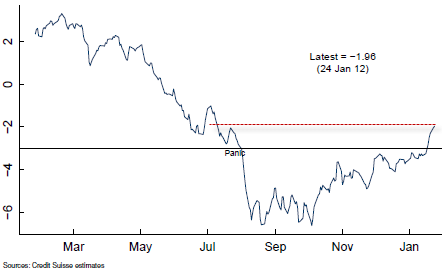 The latest reading from the Credit Suisse Risk Appetite Index shows that we are now out of the "panic mode". In fact the index is back to the pre-crisis (of 2011) levels. One way to check the validity of being back to July-2011 levels of risk appetite is to compare the CS index to another indicator. 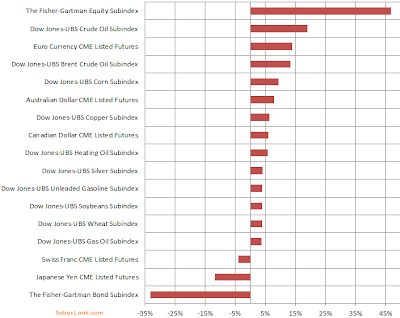 Let's take a look at the Fisher-Gartman Risk Index, developed to allow investors to participate in the "risk on" trade. This index has not recovered nearly as much as the CS one. 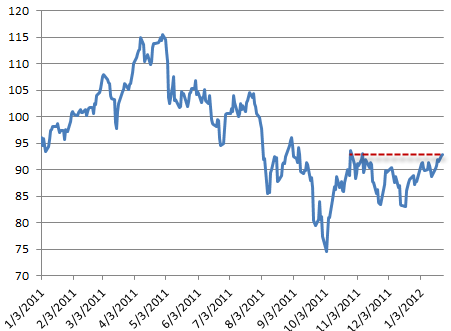 According to Fisher-Gartman we are at the highs of the Nov-2011 levels. 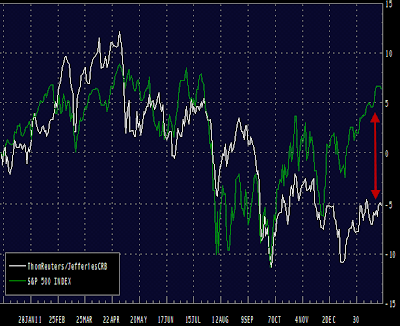 How can one explain such a difference in risk indicators? We know that the CS index is calculated from bond and equity prices including emerging markets. On the other hand the Fisher-Gartman index has a substantial commodity and currency exposure. 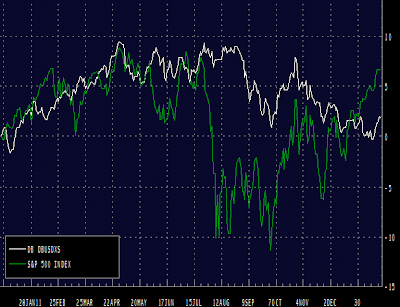 This next chart compares the CRB Commodity Index with the S&P500. Equities have outperformed commodities by over 10% since the beginning of last year. Similarly one could compare a basket of currencies as represented by the Deutsche Bank US Dollar Short Futures Index with the equity index. The equity outperformance vs. currencies isn't as pronounced as it is for commodities, but it is still close to 5% over the same period. 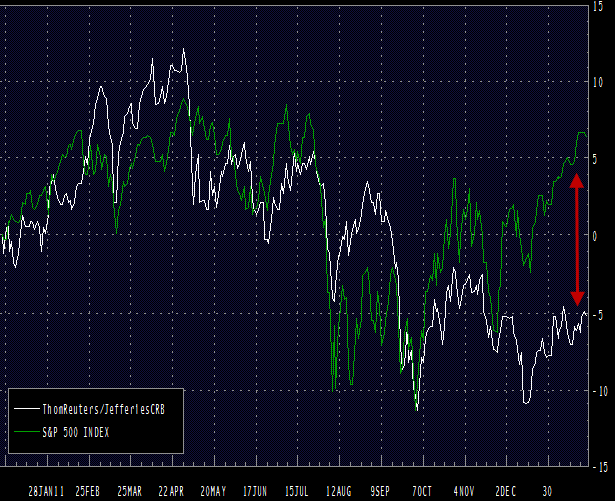 We now have the explanation for the CS Risk Appetite Index pulling significantly ahead of the Fisher-Gartman Risk Index. The difference is driven by the underperformance of currencies and in particular commodities that are not present in the CS index. The question of whether we have pulled out of the "crisis mode" therefore depends on which markets one believes better represent the global risk appetite.